Today we were all over the place. Man are my feet, legs, and back ever sore. We went back and forth for perhaps miles... From 10am to 11pm We were on Big Thunder Mountain Railroad during the fireworks, they we being launched right over our heads, seems liked the best seat ever. Mr. 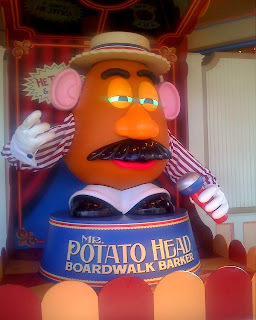 Potato Head as we are going into the new Toy Story Mania Ride. This one is awesome!!! 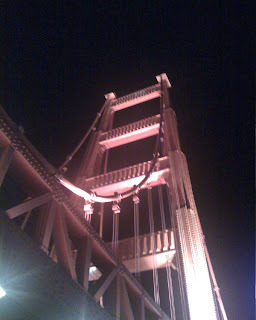 Say bye bye to the Golden gate Bridge replica that graces the entrance of California Adventure. Disney is spending $2,000,000,000 to make Disney's California Adventure a people/money magnet, because it attracts crowds not hordes of people. That is one of the reasons I liked the park! That and the fact that it was Disney without being TOO Disney. Like Disneyland for adults. Well, they are putting an end to that nonsense. As long as there are stray dollars floating out there, they are going to try to get them. They are not going to spend two billion dollars, unless they have a plan for getting it back and then some, so look for you ticket prices to go up. Hmmmm, I know this sounds weird, but if they dropped their ticket prices 10 or 20 dollars, it is my guess that they would make money in the long run because people could actually afford it. It would attract more people! 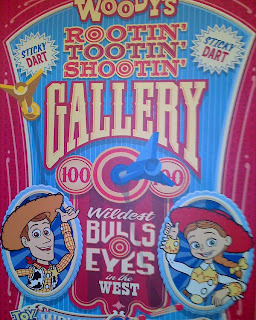 Or maybe... they could have made California Adventure a little less than Disneyland. The problem with people not coming to DCA was that they charged the same price as Disneyland despite the fact there were fewer E-ticket rides. It's not the electronic tickets of today, it is a thing of the past, but if you don't know what Disney E-tickets are google it. Well anyway, they took a PERFECT Treb park and ruined it with improvements. It's like the Mona Lisa, one more brush stroke would probably have ruined it. Leonardo Da Venci was smart enough to realize this, and was not driven by my $$$. If they had enough money to invest 2 billion, maybe they didn't need to make it into a dollar magnet. Oh well, I'm still and Disneyphile and I will be coming back. I have too! 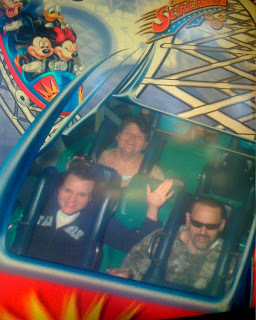 I gave them $530.00 for annual passes for Patti and I, and I am GOING TO GET MY MONEYS WORTH! still looks like super fun!